The Y Drill will help you focus on maintain the position you establish at address, keeping your shoulders, arms and golf club in a consistent position throughout the shot. The Cross Foot Drill will train you to stay centered and steady to hit down on the ball crisply instead of moving laterally or side-to-side. The One Foot Only Drill will teach you how to hit down on the ball, compressing it, getting it to pop up and putting some spin on it. 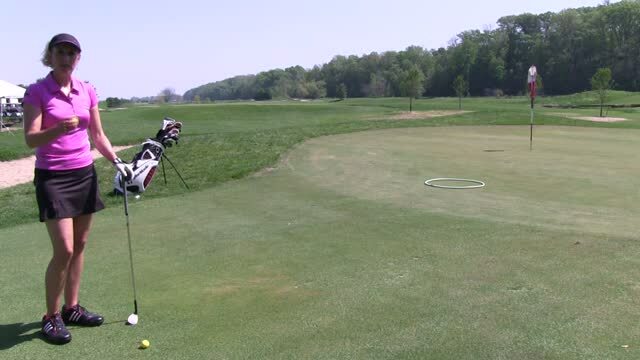 The Hula Hoop Drill helps you focus on your landing spot, and then get accustomed to how much the ball is going to release and roll towards the pin. The Pencil Drill trains you to keep your front wrist nice and flat and use your big muscles to make a one-piece pendulum stroke instead of getting too wristy or flippy with your chips. The Right Hand Only Drill helps you maintain the angle set with your back hand in your back swing throughout the chip to eliminate a flip which leads to fat and thin shots. The Flip Preventer Drill helps prevent you from getting too wristy or handsy on your chips and pitches and gets you moving in more of one piece, using your big muscles of your shoulders and back. The Towel Drill will help you release the club a little later in your chip shots, giving you much better control over your distance and speed on those chips. The Arm Your Club Drill can help if you are inconsistent with your chip shots and have a tough time controlling the release of the club, which can result in fat or thin shots. The Limbo Drill helps you keep your green-side chips as low as possible to get the ball rolling on the putting service as quickly as you can. The Coin Down Drill is a great way to practice hitting down on your chip shots properly to ensure you are getting the ball to pop up as it should and giving it the correct spin.